The most amazing direct panoramic city views from this 928 sq. ft. rare gem one bed with balcony located on a high floor at the LHaus condos in prime LIC – easily converts to 2 bed also. With 9’+ ceilings, this loft- feeling over-sized one bed features white oak floors, Bosch and Liebherr stainless steel appliances, high-gloss cabinets, and stainless steel backsplash creating a sophisticated and modern open kitchen overlooking an ideal space for a full size dining room table. The living room is super spacious, perfect for entertaining guests as they enjoy the gorgeous direct west view of Manhattan (including One World Trade Center), Brooklyn and Queens. The oversized bedroom has fantastic closet space and fits a king size bed. Porcelain tile floors, custom white lacquered vanity, glass wall tiles and a deep soaking tub highlight the bathroom. Unit also comes with custom remote controlled shades. The LHaus, a full service building, offers nearly 5000 sq. ft. of indoor amenities including a 1500 sq. ft. Club Room (perfect for parties!) and a 1700 sq. ft. Fitness room – both of which overlook “The Yard” which contains a large grill, lounge chairs and tables. There is also a 575 sq. ft. Yoga Room, 880 sq. ft. Media Room, 2 Roof Terraces, 24/7 doorman and live-in super. Conveniently located one block to the 7 train and 3 blocks to the E, G and M trains. 15 year tax abatement in place (421-A) until 2023. Hurry while this rare gem lasts! The most amazing direct panoramic city views from this 928 sq. ft. rare gem one bed with balcony located on a high floor at the LHaus condos in prime LIC - easily converts to 2 bed also. With 9'+ ceilings, this loft- feeling over-sized one bed features white oak floors, Bosch and Liebherr stainless steel appliances, high-gloss cabinets, and stainless steel backsplash creating a sophisticated and modern open kitchen overlooking an ideal space for a full size dining room table. The living room is super spacious, perfect for entertaining guests as they enjoy the gorgeous direct west view of Manhattan (including One World Trade Center), Brooklyn and Queens. The oversized bedroom has fantastic closet space and fits a king size bed. Porcelain tile floors, custom white lacquered vanity, glass wall tiles and a deep soaking tub highlight the bathroom. Unit also comes with custom remote controlled shades. 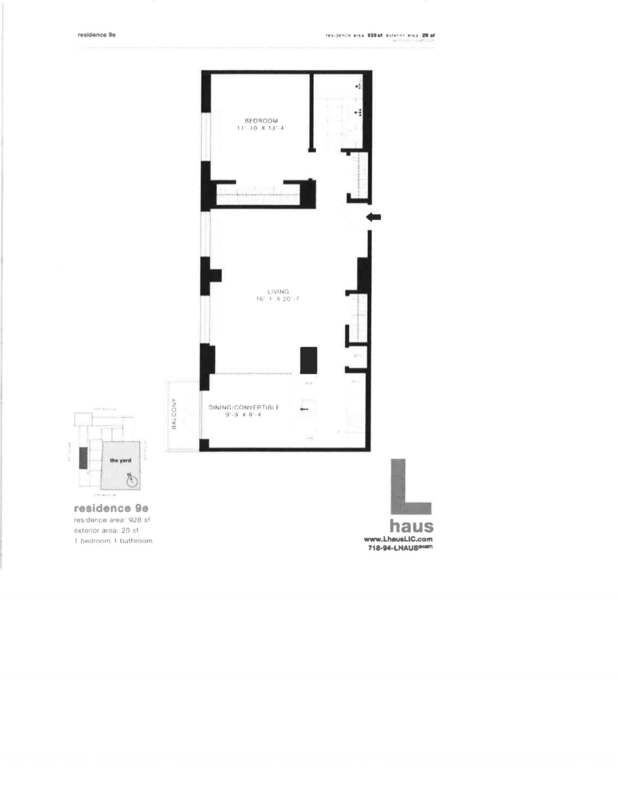 The LHaus, a full service building, offers nearly 5000 sq. ft. of indoor amenities including a 1500 sq. ft. Club Room (perfect for parties!) and a 1700 sq. ft. Fitness room - both of which overlook "The Yard" which contains a large grill, lounge chairs and tables. There is also a 575 sq. ft. Yoga Room, 880 sq. ft. Media Room, 2 Roof Terraces, 24/7 doorman and live-in super. Conveniently located one block to the 7 train and 3 blocks to the E, G and M trains. 15 year tax abatement in place (421-A) until 2023. Hurry while this rare gem lasts!